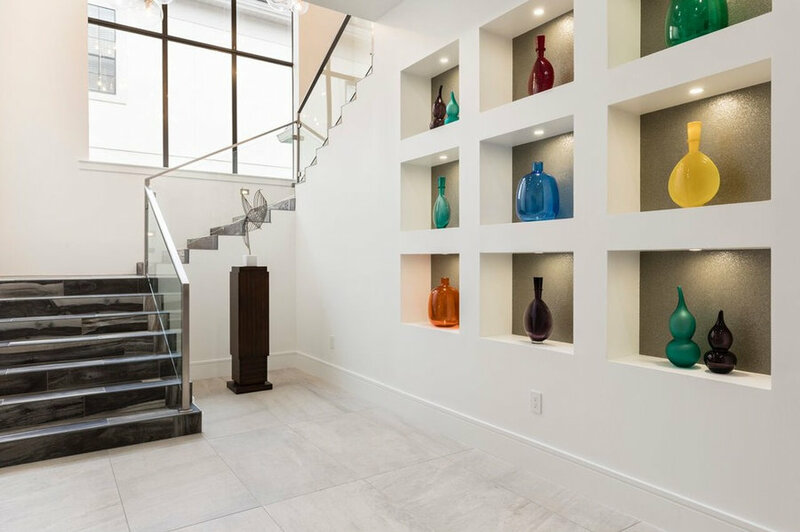 Circular entry foyer with whirling colorful pendant design showcase the magnificence in the recessed lit ceiling design. 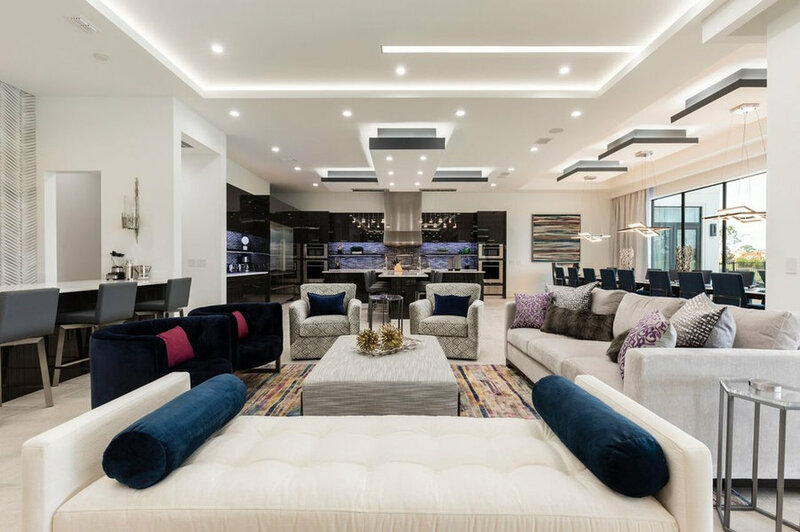 This round settee set front and center is stunning inviting you in from every direction and leads to architectural lighting details down the hallways. 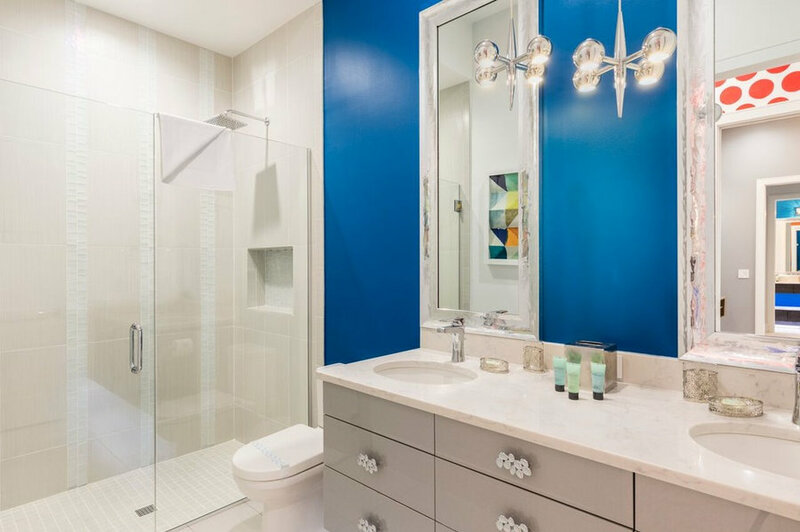 This powder bath off the front entrance is out of this world with unexpected blue wallpaper, gold and mirrored accents and floating counter. 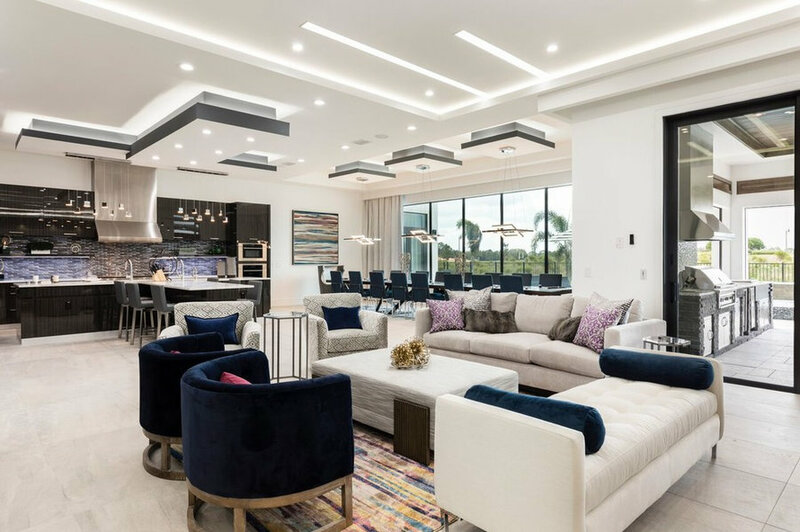 Expansive lit custom ceiling details to an open living room arrangement in blues and plums invite you to relax in this comfortable living area off the pool. 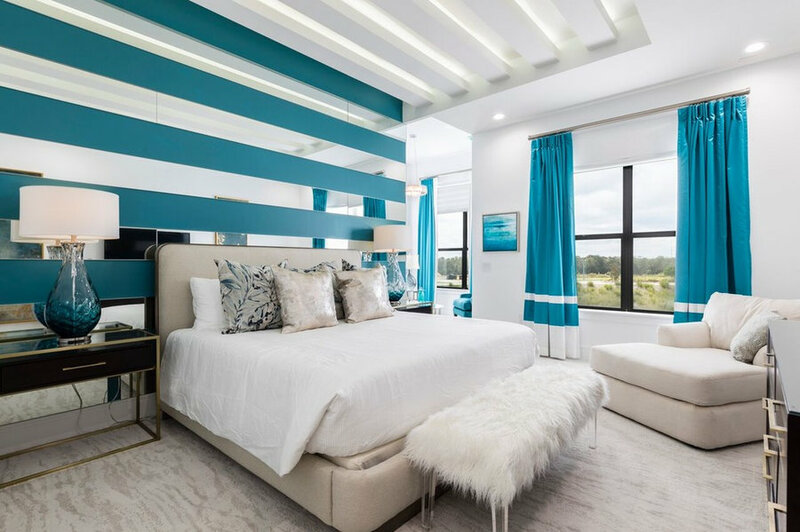 Expansive lit custom ceiling details to an open living and room arrangement in blues and plums invite you relax in this comfortable area off the pool. 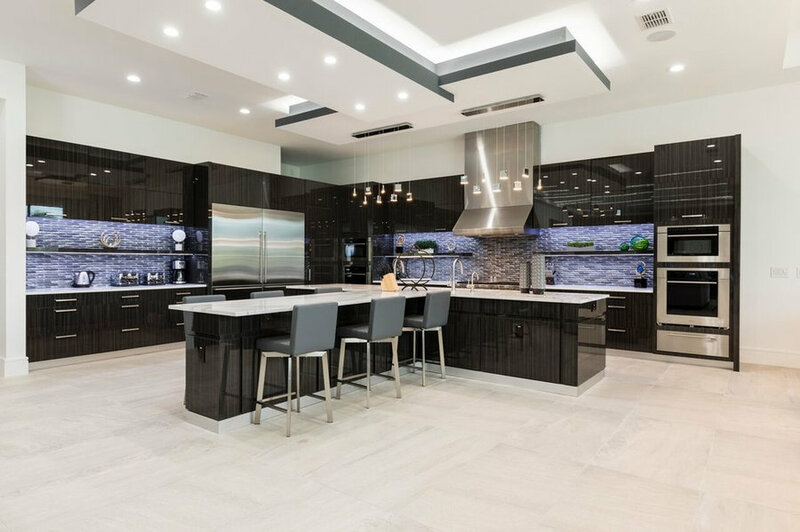 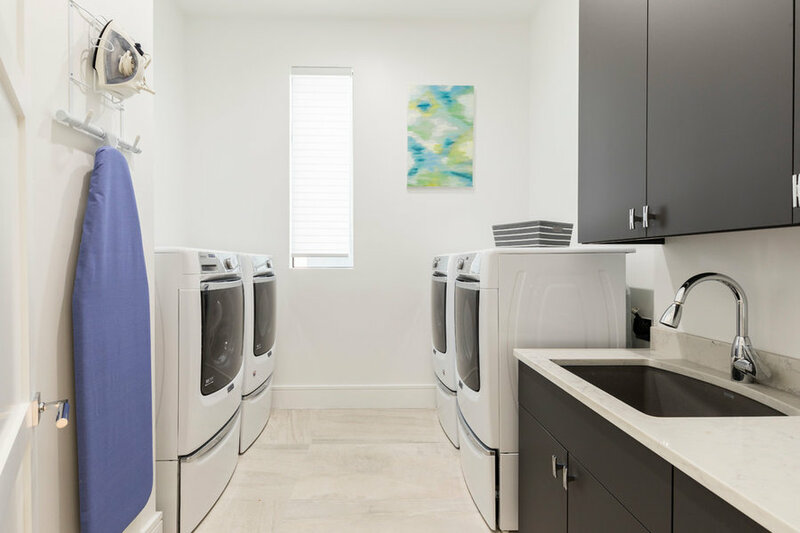 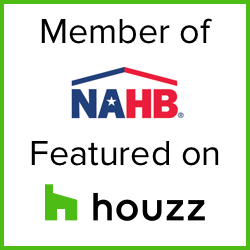 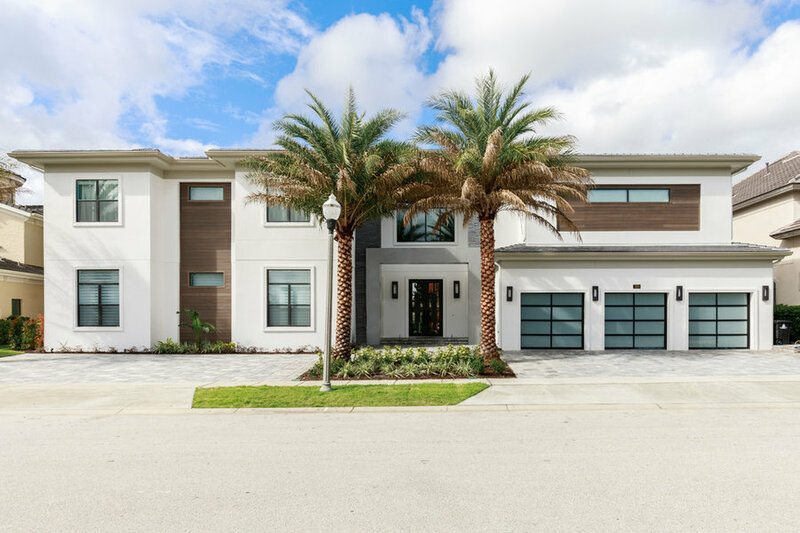 This modern kitchen design with T-shaped island, double sinks, dishwashers, subzero appliances, hidden spacious pantry, open backsplash and shelving, exotic cabinets and seating for six invite to stay awhile. 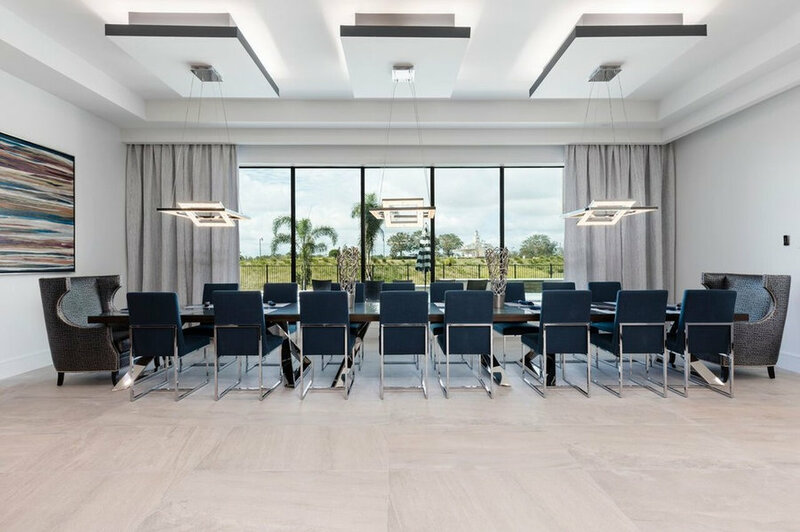 Custom dining table with espresso and chrome legs allows seating for 18 in this modern designed dining room. 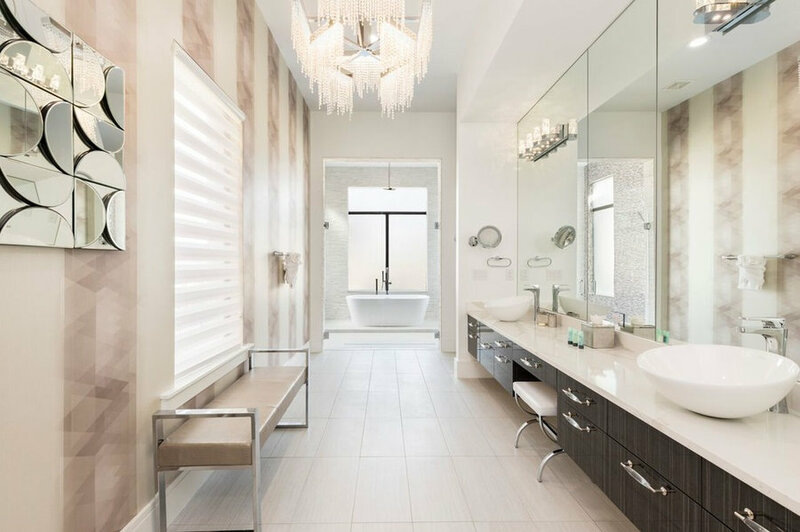 Magnificent floating Roman tub in the midst of the shower is only one of many beautiful things in this downstairs master suite. 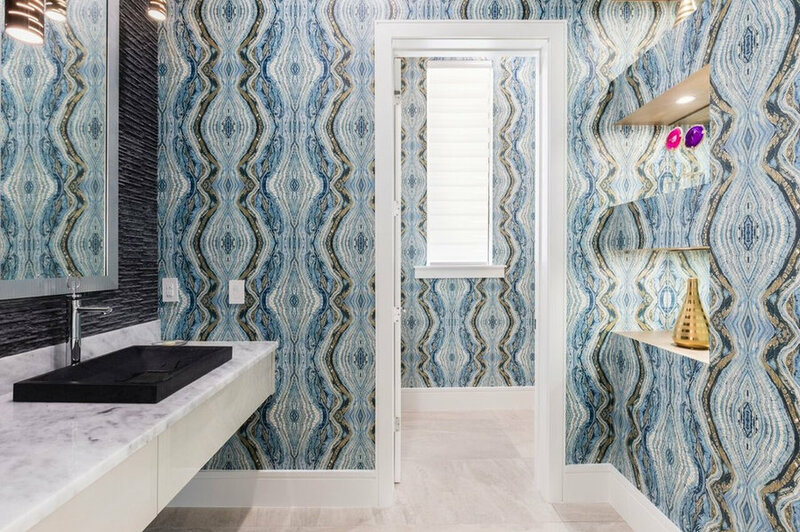 Vertical geometric stripe wallpaper lines the length of the bath. 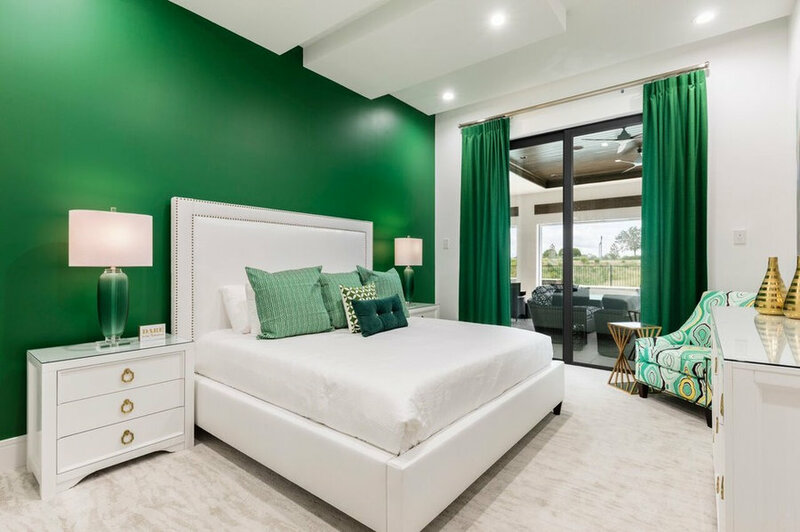 This emerald green inspired room with ceiling cut outs and detail are embellished with a colorful retro chair in gold and green accents. 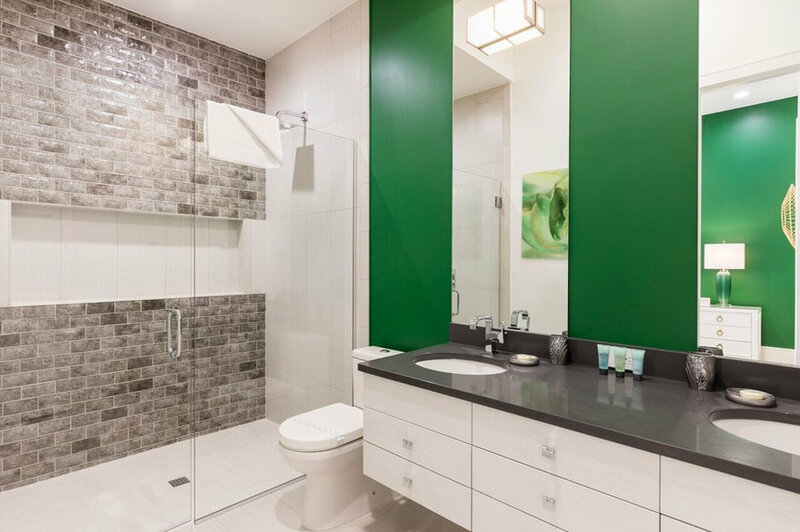 The emerald green paint and custom mirrors with floating cabinets are beautiful features that only enhance the brick lay shower wall detail. 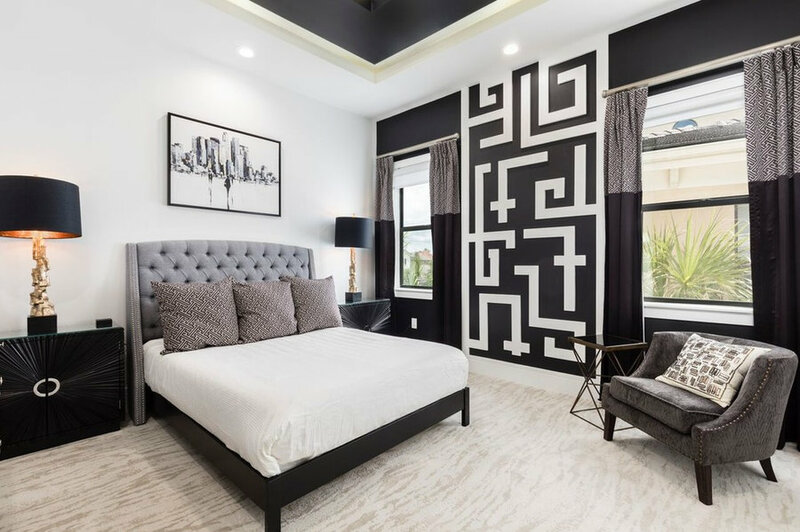 This black and white inspired bedroom detailed with a custom fabric wall headboard from floor to ceiling highlights this fun room with pops of gold and fur benches. 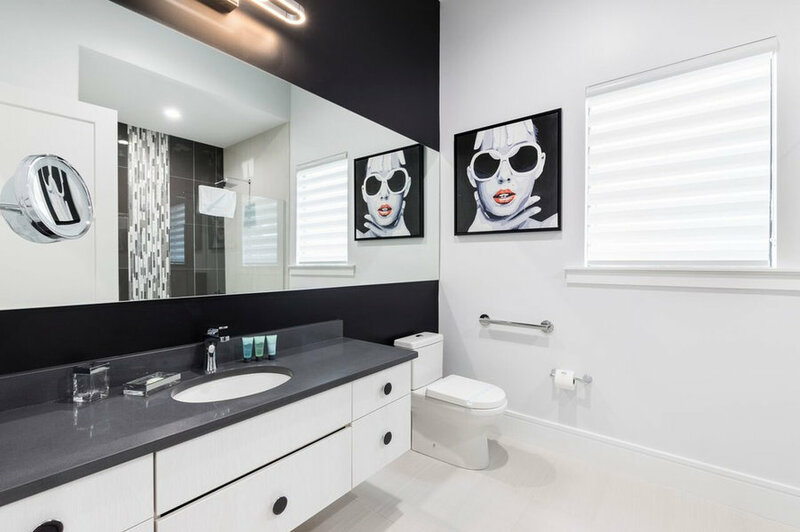 This clean lined black and white inspired guest bath has a floating cabinet, black quartz countertop, wall to wall mirror and fun pop art. 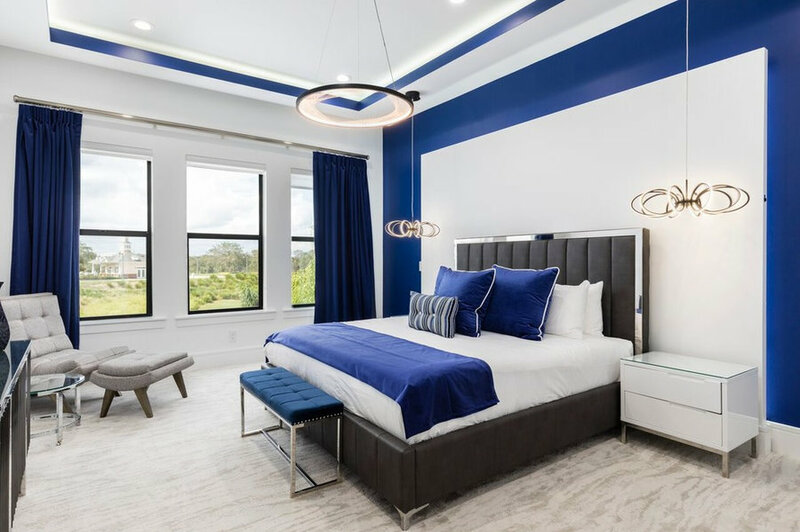 This contemporary design bedroom is a covered in pops of bright blue, chrome panel grid and chrome bed, drop crystal chandelier and black / crystal nightstand pendants. 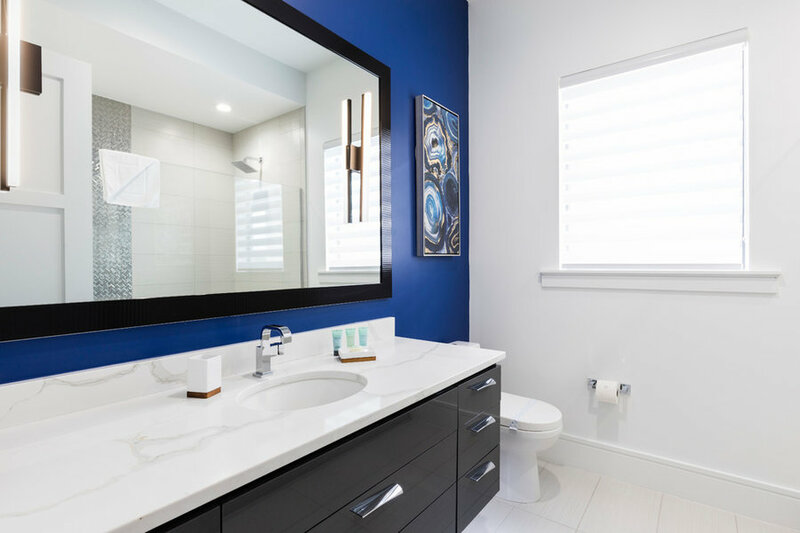 Bright blue and black floating cabinets with underlighting capture your attention in this downstairs guest bathroom. 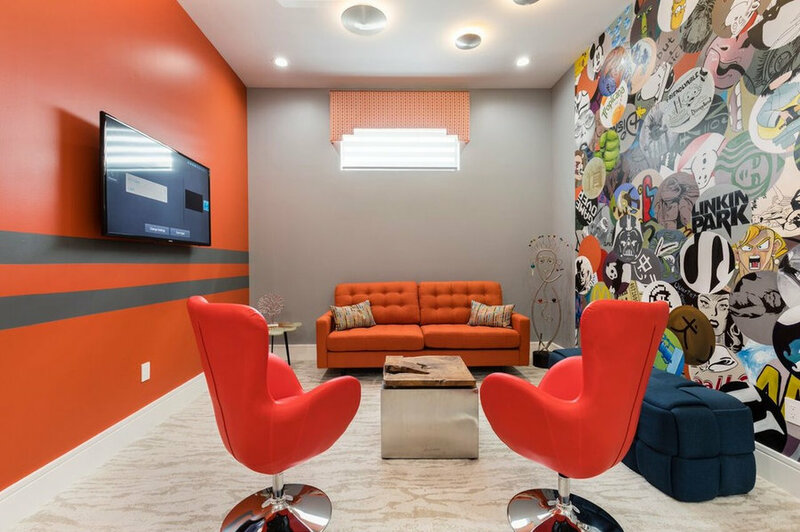 This teen bedroom is a pop art dream with custom painted wall mural and retro desk and chair. 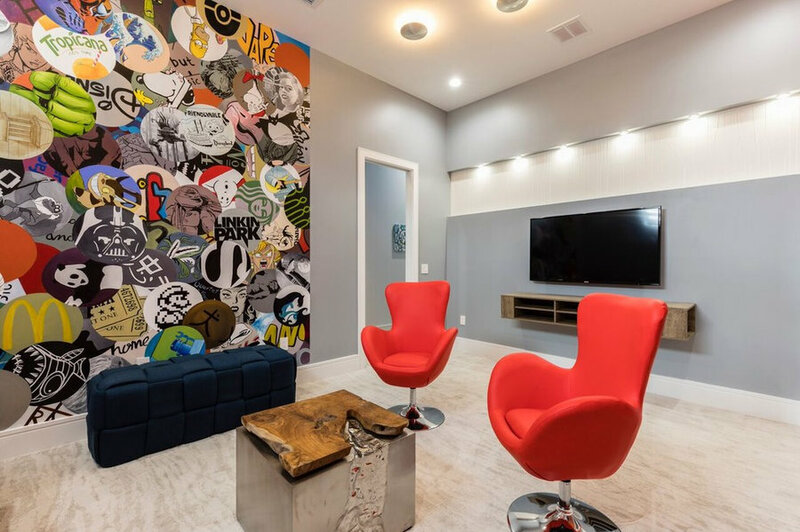 This teen gaming room is decked out with hand rendered graffiti focal wall and bright red swivel chairs. 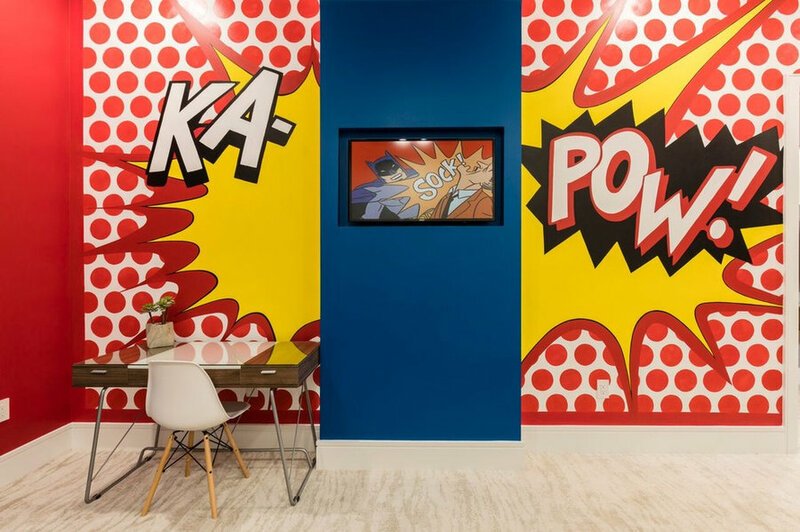 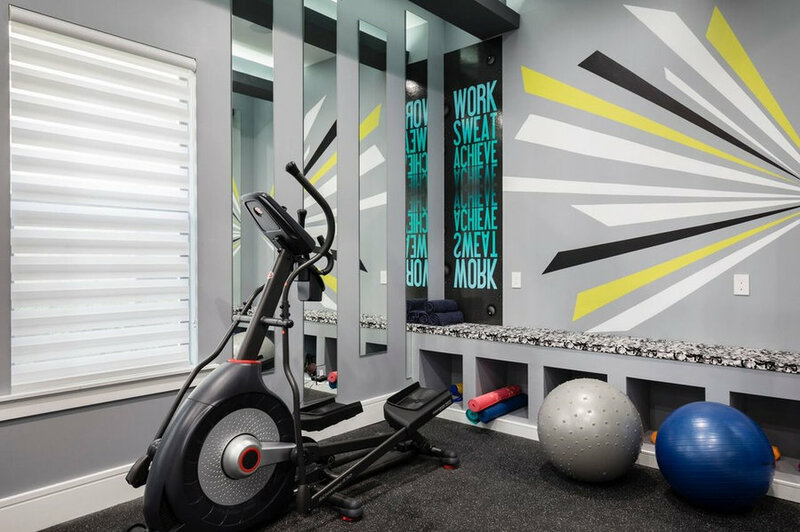 Custom mirrors, colorful murals and cubbies add to a great place to get motivated and have a great workout! 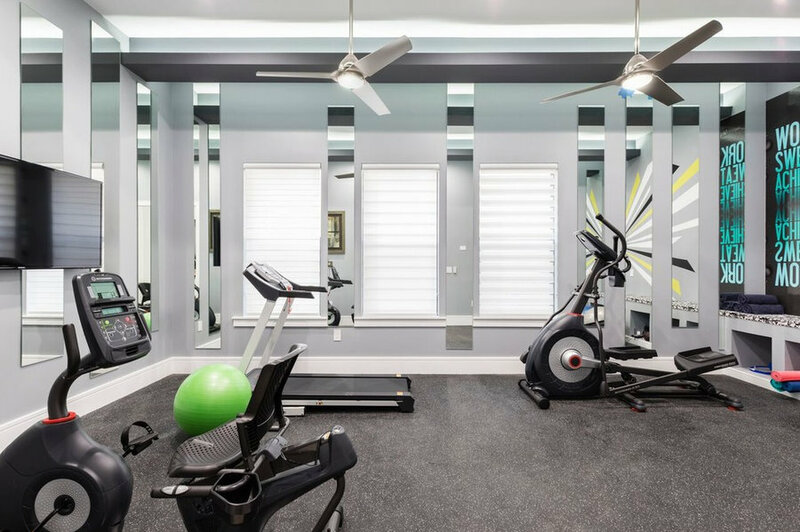 Custom mirrors, colorful mural and cubbies add to a great place to get motivated and have a great workout! 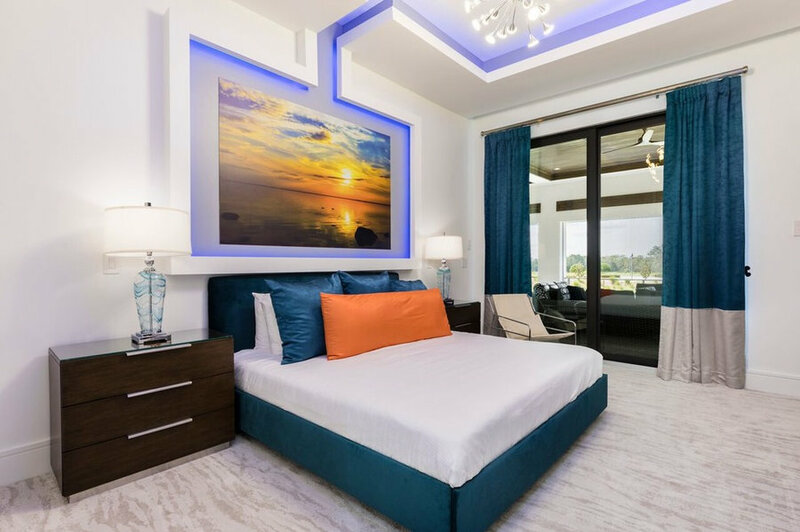 Feel like your at the beach during sunset in this modern designed guest bedroom, detailed lit custom wall and ceiling showcasing a modern drop chandelier. 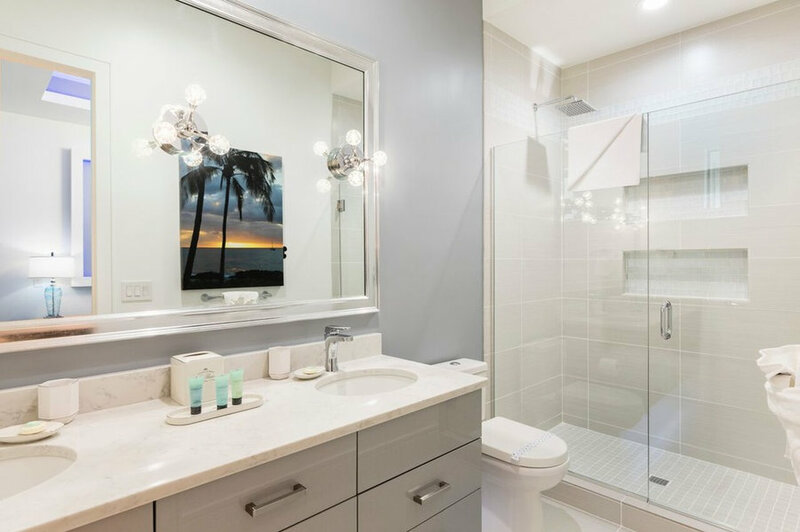 This clean lined guest bathroom perfectly mirrors the sunset theme attached bedroom. 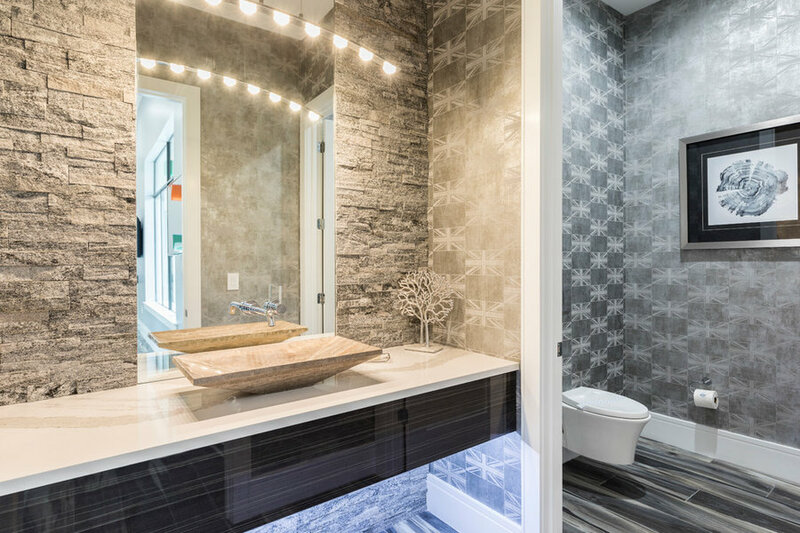 Modern fixtures and decorative shower wall detail. 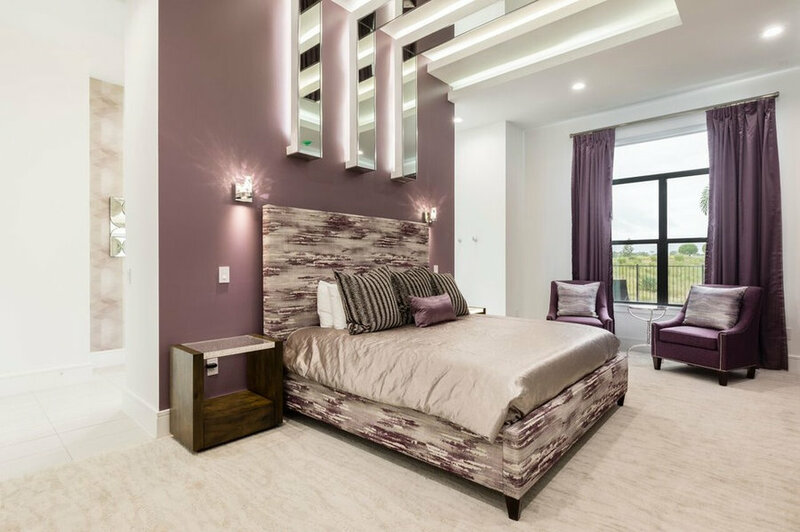 This master bedroom is a modern design dream with wall to wall custom mirrors to reflect lit ceiling details. 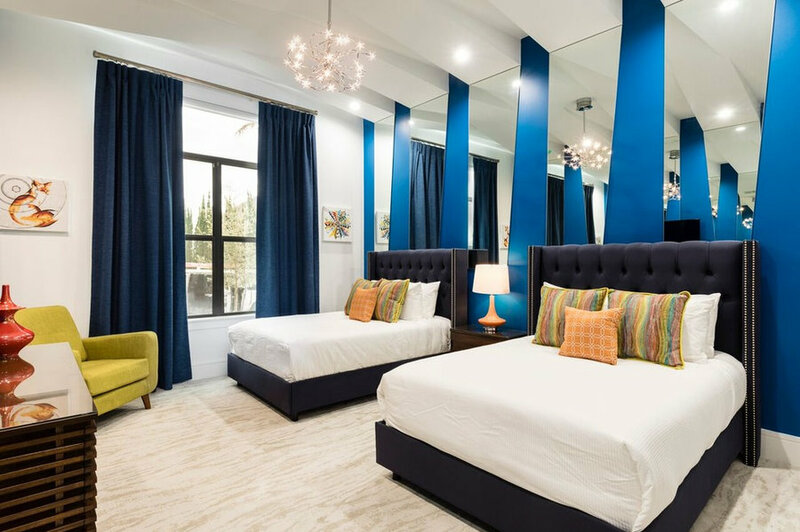 Relax in this upstairs master suite with attached sitting room. 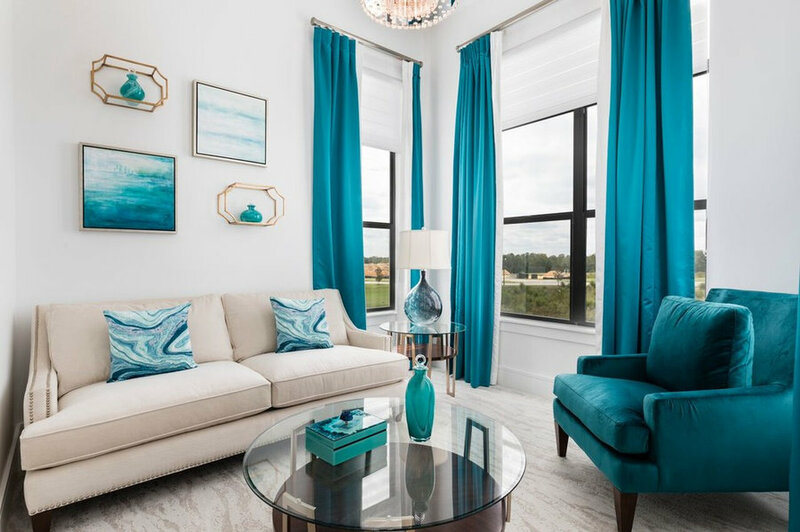 Modern comfortable owners suite sitting room with all the amenities with pops of torquoise and blue hues. 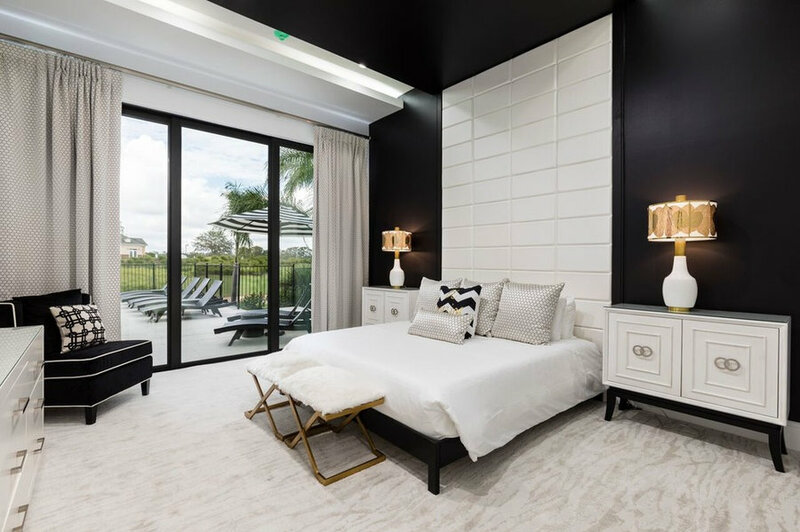 This Fendi inspired guest bedroom exhibits decorative black and white details and gray velvet headboard with silver nailheads. 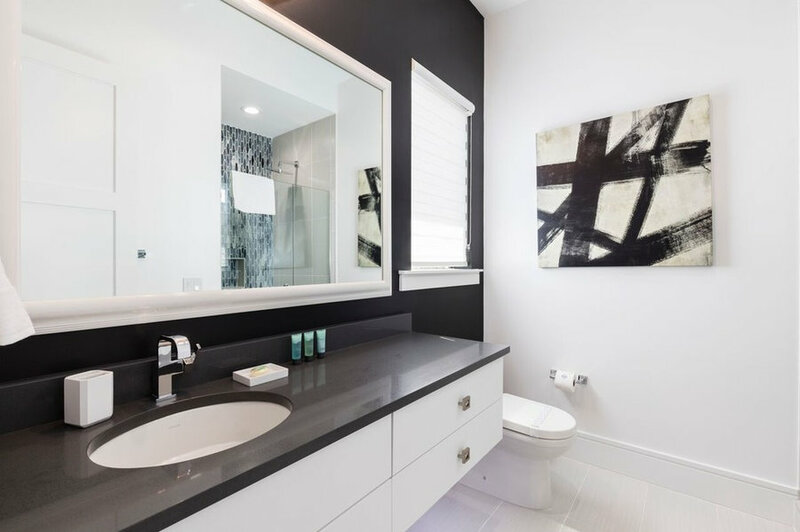 This black and white themed guest bath is clean lined with floating white cabinets, black countertops, decorative shower wall and abstract artwork. 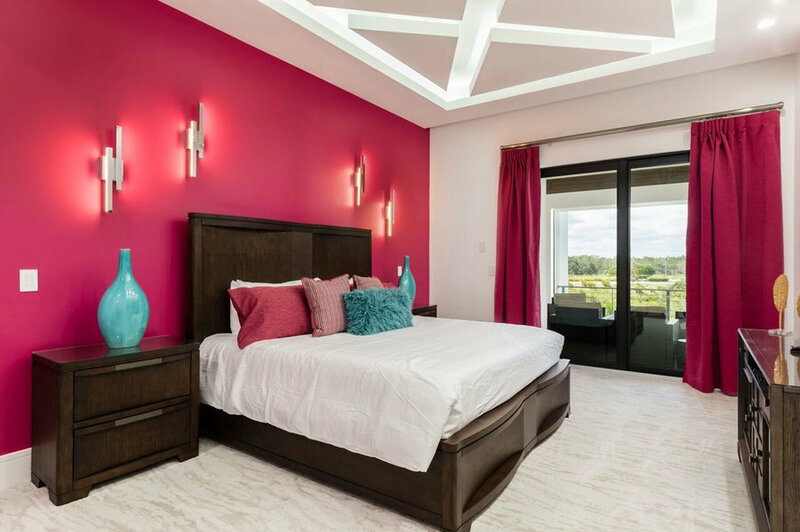 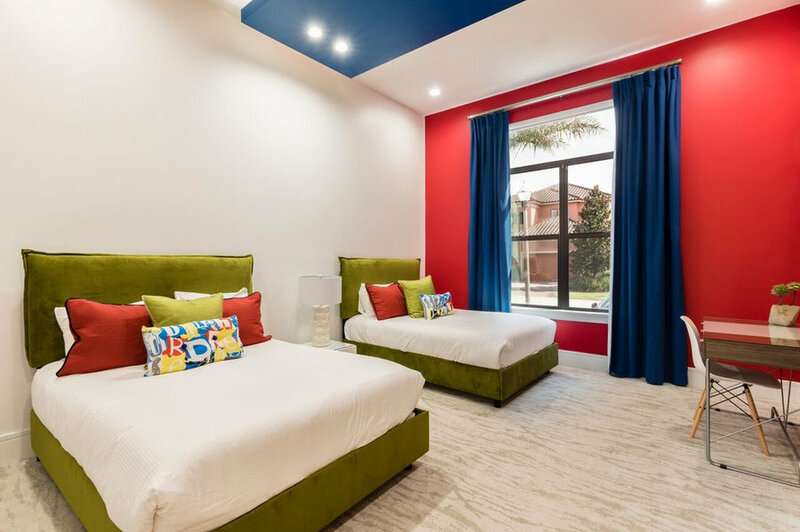 This modern bright pink and blue inspired bedroom has a custom designed ceiling detail with lights, contemporary wall sconces and a bed that has built in lighting. 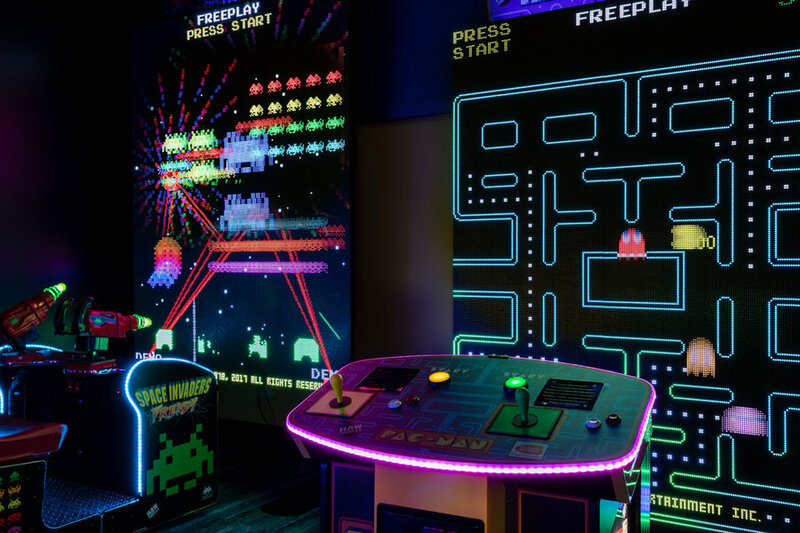 Out of this world video arcade behind hidden door! 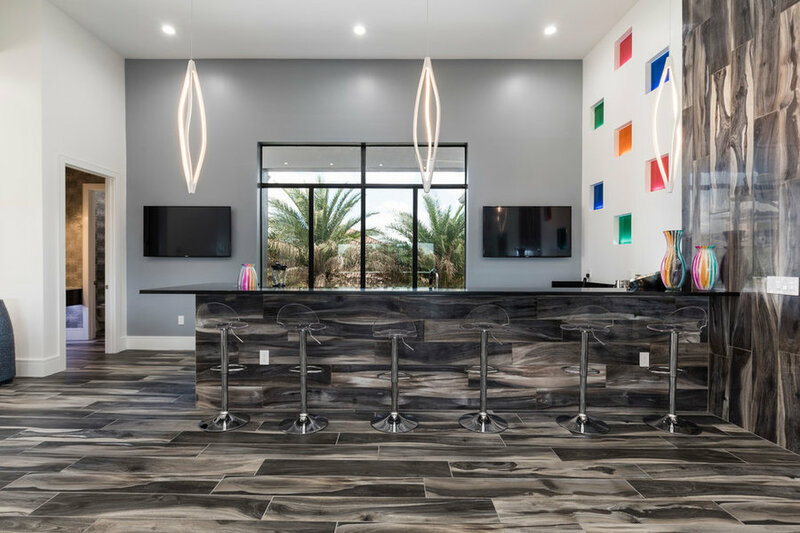 Dramatic back lit colored wall features, wall detail to the celing and large contemporary drop pendants draw you into the upstairs bar and game room. 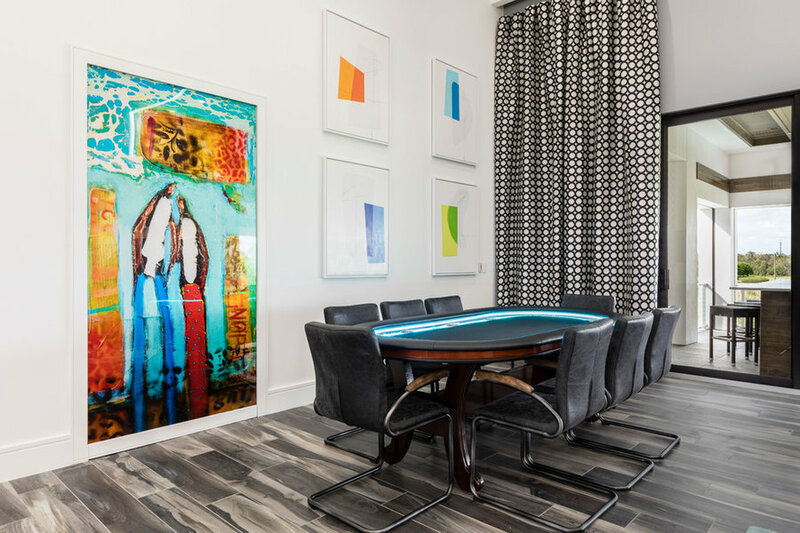 Game and family room dream, with expansive lit ceiling details, contemporary details in the furnishings, windows and walls. 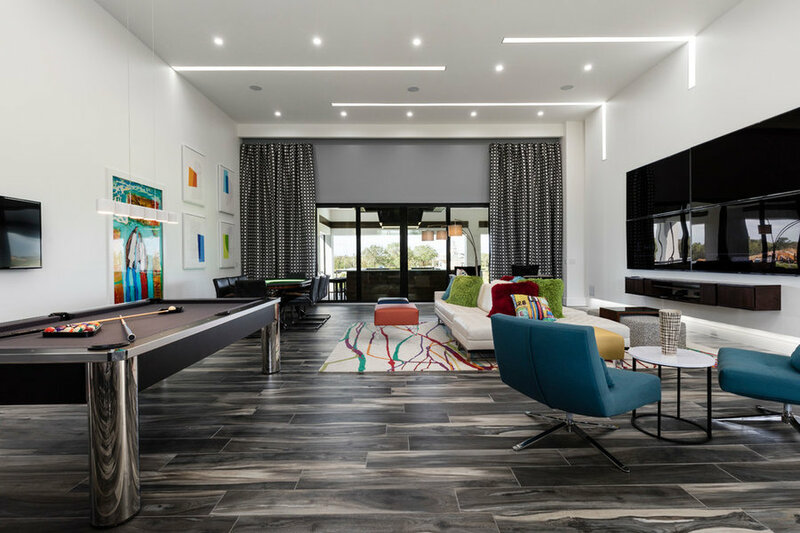 Game and family room dream, with expansive lit ceiling details, contemporary details in the furnishings, windows and walls. 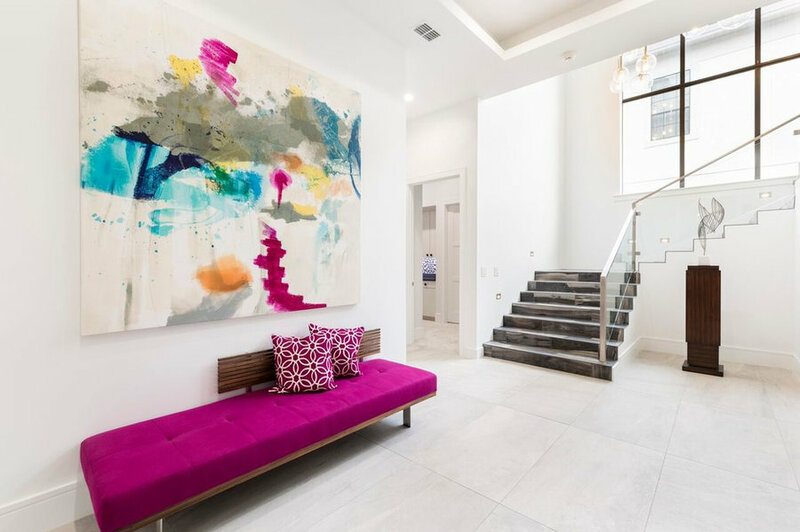 Bright pops of color mixed with porcelain wood grain floors. 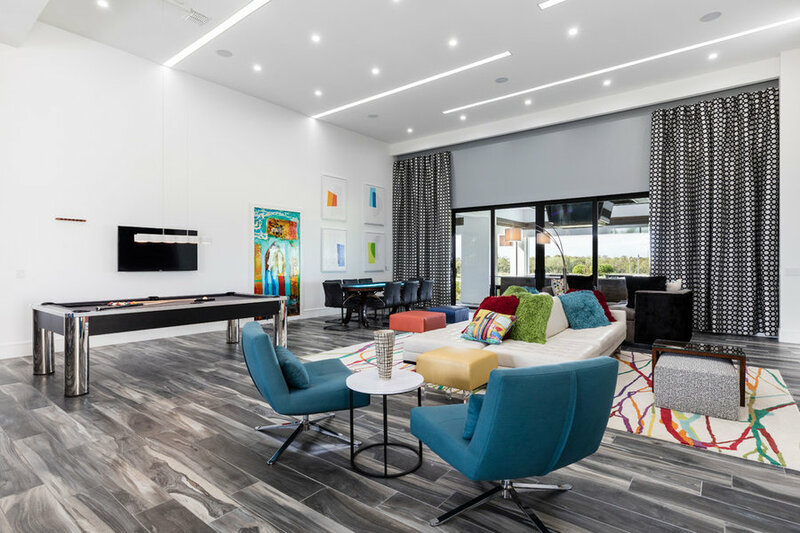 Game and family room dream, with expansive lit ceiling details, contemporary details in the furnishings, windows and walls. 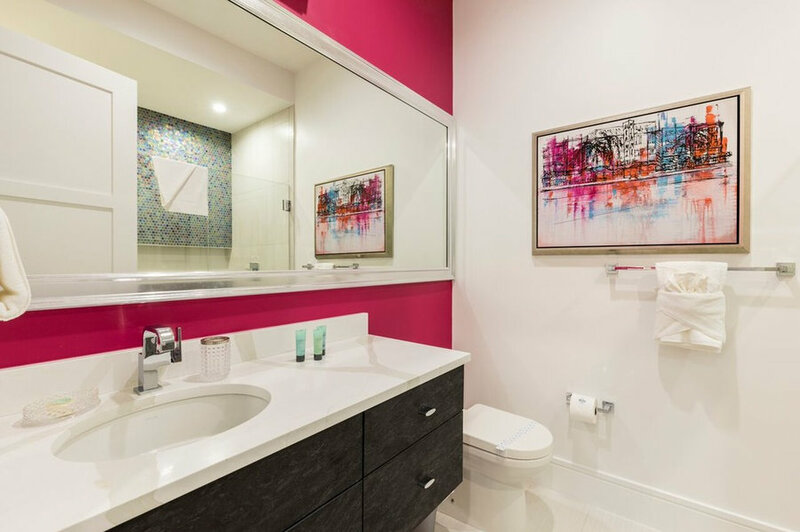 Bright pops of color mixed with porcelain wood grain floors. 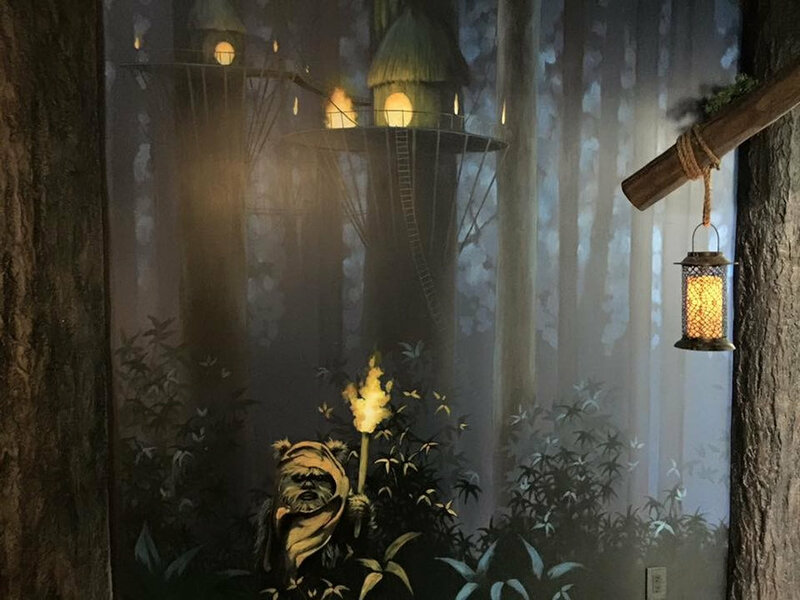 Debilzan art hides the secret door to out of this world arcade! 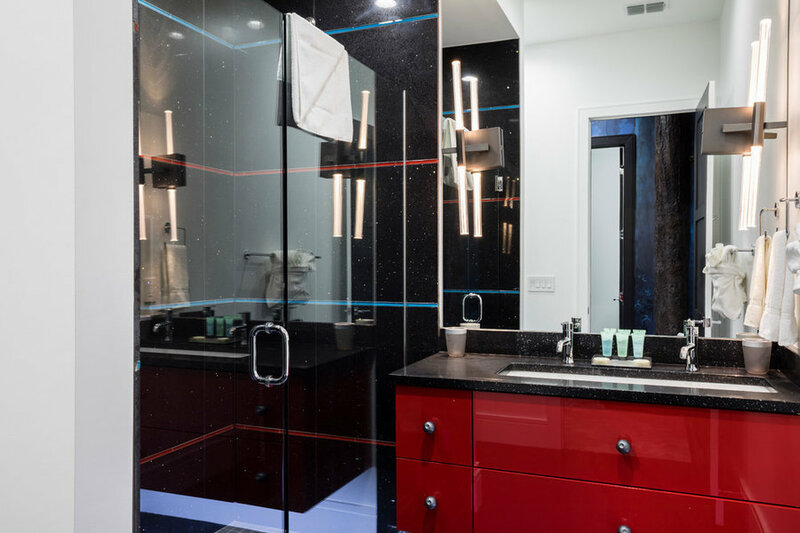 Red floating cabinets with underlighting, black quartz top with flecks of sparkle capture your attention in this Star Wars themed kids bath. 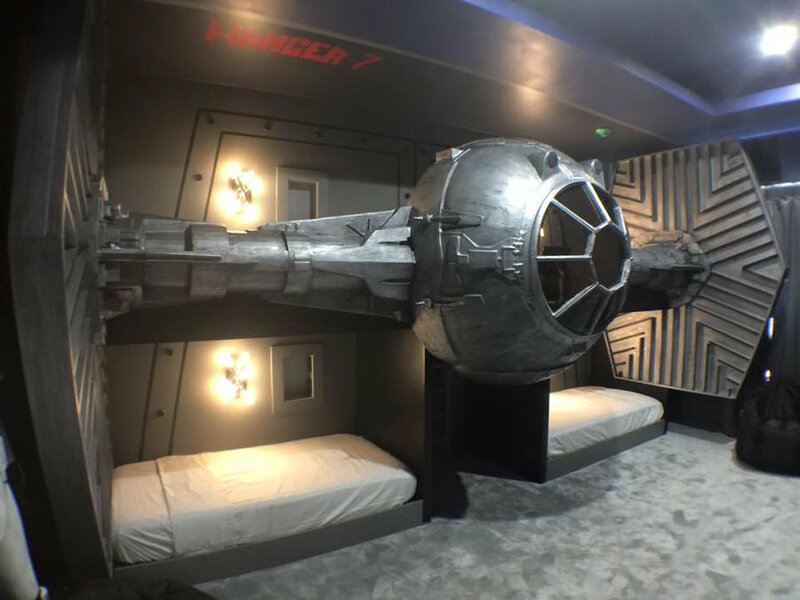 Climb into the this Star Wars TIE fighter bunk bed and feel like a Jedi! 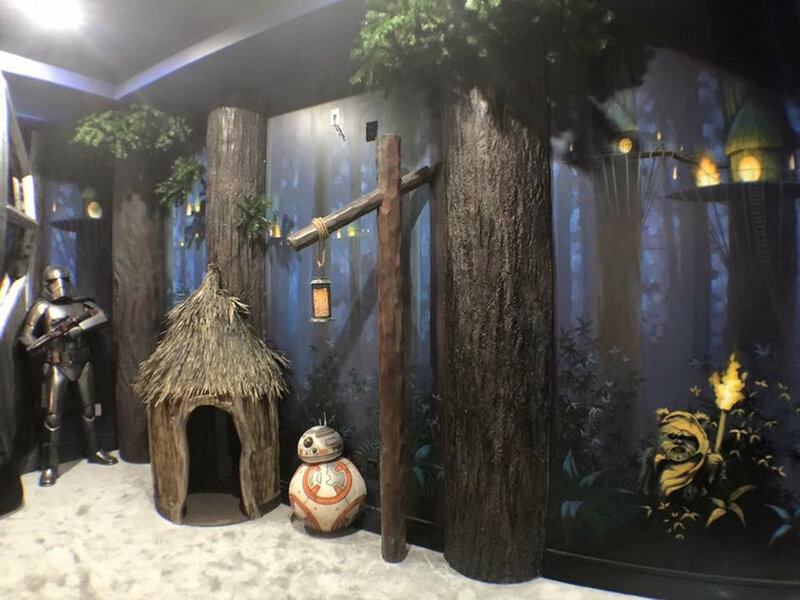 Center console has interior fighter controls! 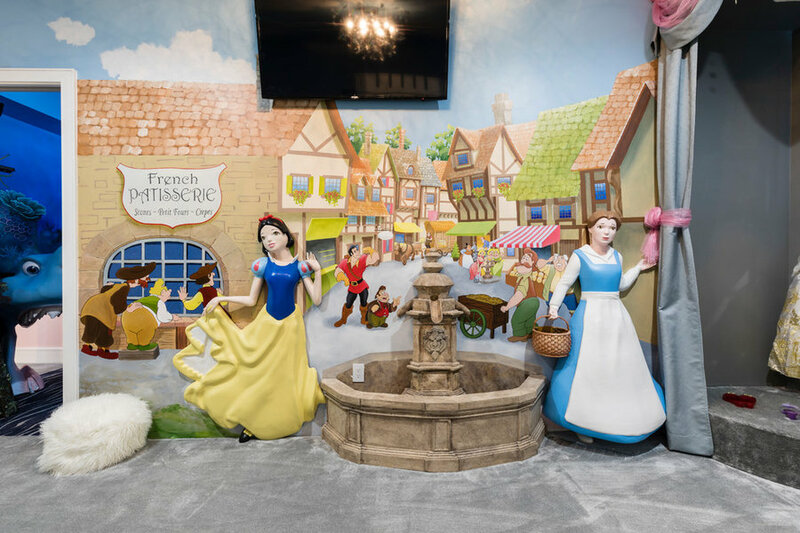 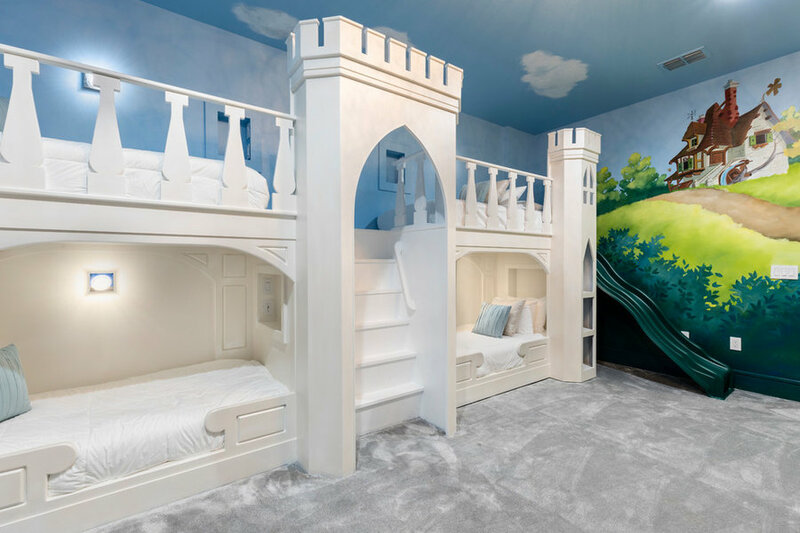 This Disney princess themed kids room is a girls dream, including castle bunk beds and slide, Beauty and the Beast fountain, stage and princess dresses. 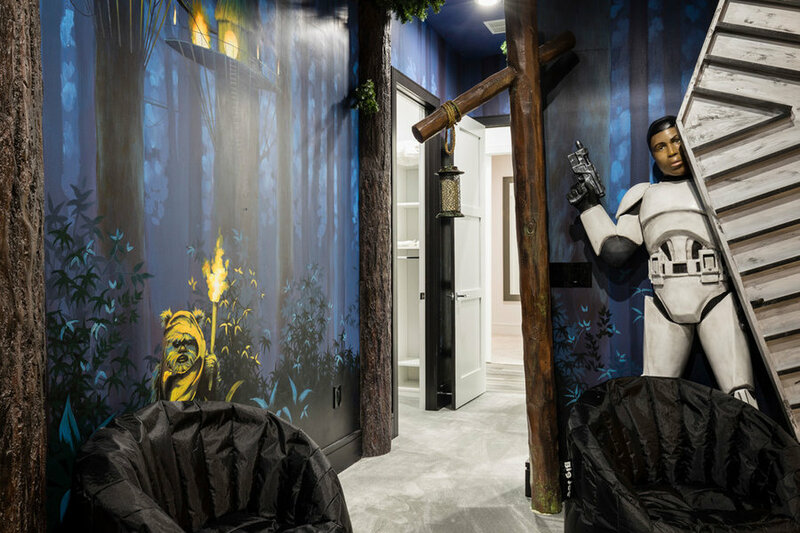 Walk thru Bruce's mouth into either the Star Wars or Disney Princess themed bedrooms. 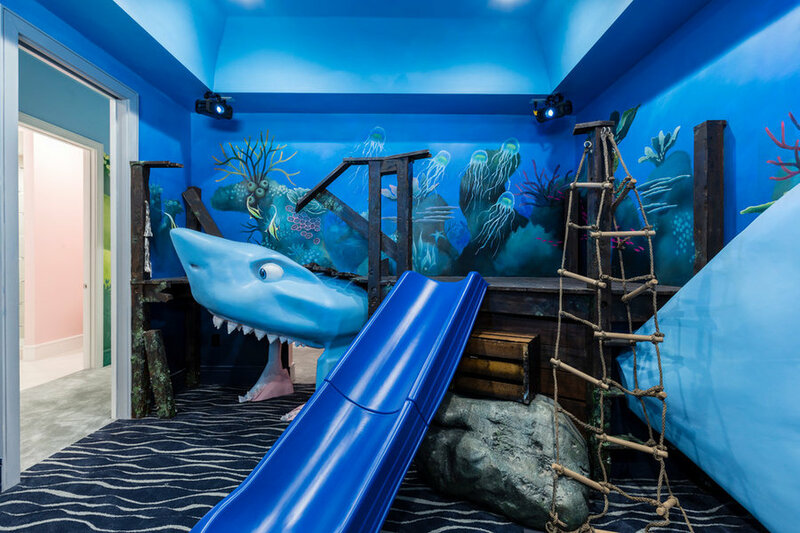 Walk into interactive Finding Nemo playroom including motion under the sea lights, slide and enormous Bruce shark from the movie. 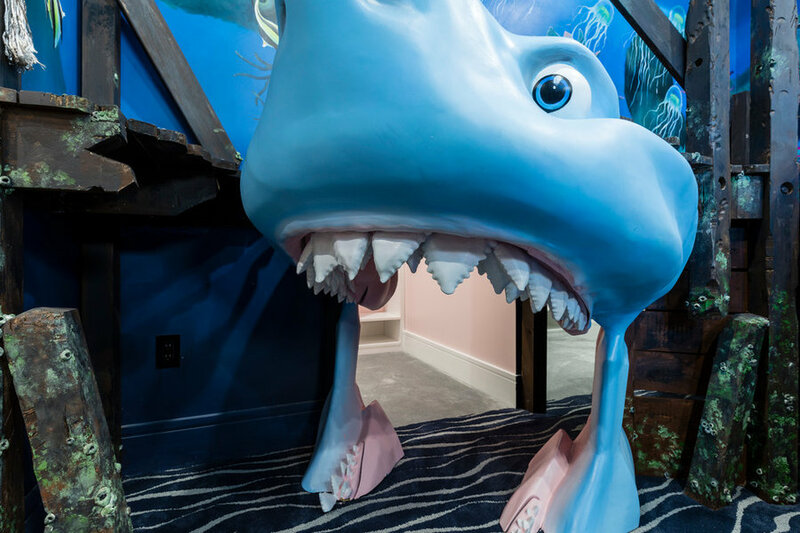 Walk into interactive Finding Nemo playroom including motion under the sea lights, slide and enormous Bruce shark from the movie. 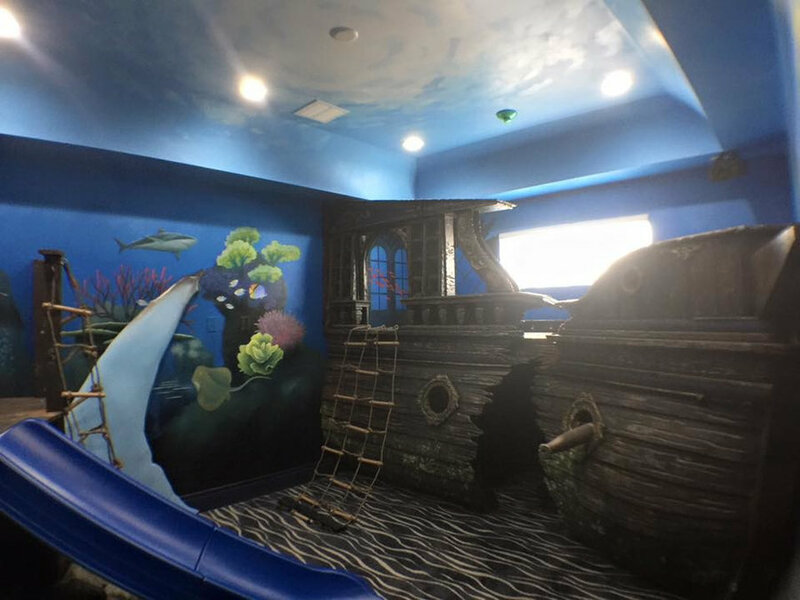 Be transported Under the Sea in this interactive kids playroom including walking thru Bruce the Sharks mouth into hidden rooms, playing in and on this sunken pirate ship and slide into the sea on the slide. 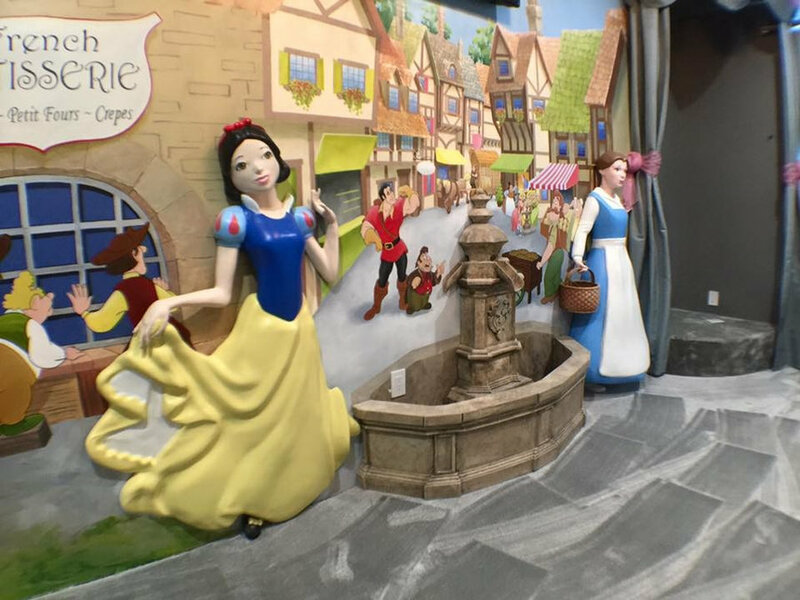 Includes media sounds and lighting effects! 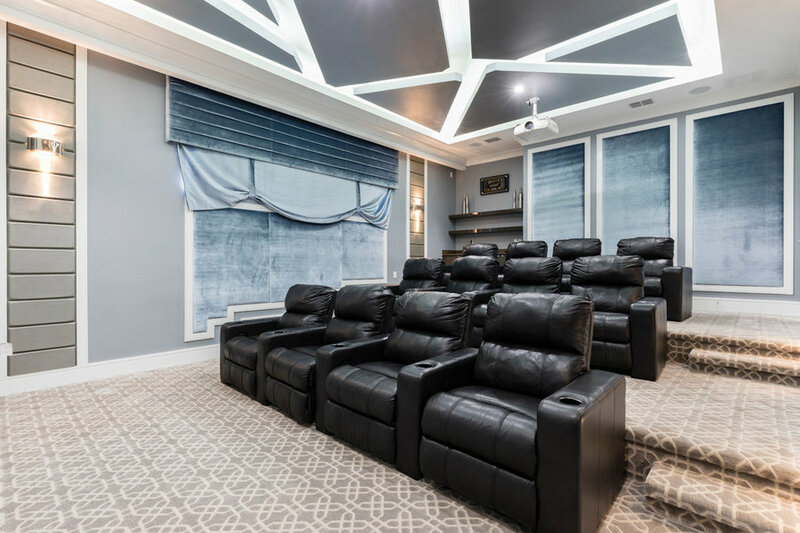 Sumptuous home theater with seating for 12 in recline seating, contemporary ceiling detail and velvet wall panels.